Joseph Leath was born in late 1849 in Tennessee, the son of Michael and Martha Leath. The 1850, 1860 and 1870 census records show them in Williamson County, Tennessee. (Although the inscription on his gravestone shows him born in 1848, it was almost certainly 1849 because when the 1850 census was enumerated, Joseph was eight months old). The Leaths must have moved to Vernon County in the early 1880's. Before long, Joseph's parents both died in 1883 and were buried in Moundville Cemetery, just west of Moundville, Vernon County, MO. This was before the town of Bronaugh had been founded. The newly widowed, Virginia Leath Gooch, and her children also left Williamson County, TN and moved to Vernon County at about the same time as her parents (Michael and Martha Leath) and her brother Joseph Leath. The top of the Gooch grave marker in Moundville Cemetery is shown to the right. (Thanks to Nancy Thompson for this enhanced image). This stone is a bit confusing at first. The name on the bottom front of the stone is Gooch. (Go to the Gooch web page to see the entire stone). On the sides is the engraved information for Patrick and Maggie Gooch. On the top, shown here, is the curved engraved information for Michael Leath and and wife, (Maggie and Patrick's grandparents). 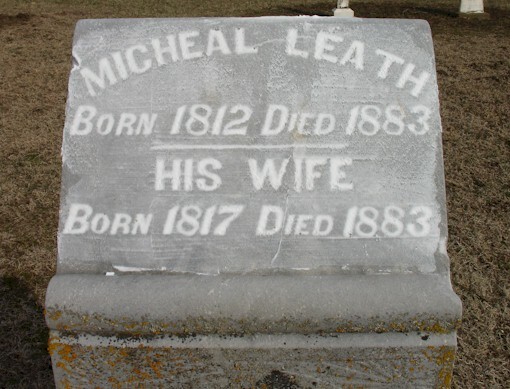 The grave marker gives the dates for Michael Leath as 1812 - 1883 and for "his wife" as 1817 - 1883. No circumstances for the deaths in the same year have been found. When the town of Bronaugh was being built between 1886 and 1888, Joseph Leath was involved in many building projects. In fact, he received the contract to build Bronaugh's frame school building in 1888. The family was listed as residents of Bronaugh, Missouri in the 1900 census where Joseph still was a carpenter. Since daughter Virginia was born in Missouri, this means that the family had come to Missouri before the fall of 1882. Son Willie died in 1890 at the age of 16. Teachers were announced for the fall school year, 1901 at the Bronaugh School. Mrs. Hadsell was in charge of the grammar school and Miss Pearl Leath, the primary department. Virginia Pearl Leath married Sterling P. Linn on March 13, 1904 in Vernon County. 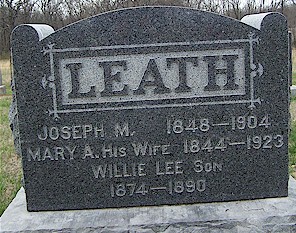 J. M. Leath died in Bronaugh on April 30, 1904, of blood poisoning. His funeral was conducted by Rev. Hageler of Moundville with burial at McKill Chapel. Just a few days later, Henry Harrison purchased the carpenter shop and tools of the late Mr. Leath. He left a wife, Mary, and three daughters, and was buried in McKill Cemetery west of Bronaugh in Harrison Township. Mary Alma Leath married Forrest Linn on December 24, 1908 in Vernon County. Forrest was a brother to Sterling P. Linn. The 1910 and 1920 census records show Mrs. Leath living in Bronaugh. Her maiden daughter, Mattie, lived with her. 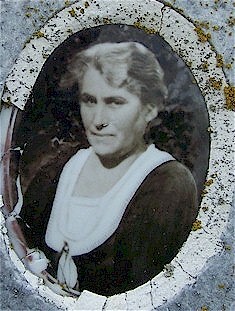 Mrs. Mary Ann Leath died April 17, 1923 at Bronaugh. Her death certificate tells that her parents were Samuel Parman and his wife Malinda Bird and that her birth date had been April 6, 1844. T. D. Combs was the attending physician and daughter Mattie Leath was the informant. The 1930 Vernon County Census for Nevada, shows Mattie Leath married to Charles Mische. Mattie was age 53 and reported that she had been age 50, at the time of her first marriage. Mattie Leath Mische is buried in McKill Cemetery near her sister Virginia Pearl. 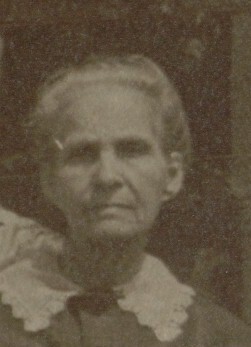 Scan of a photo from the Bronaugh Methodist Church of "Mrs. Leath"
Virginia Pearl Leath Linn, wife of Sterling Price Linn. Photo from grave marker, McKill Cemetery. If you have Leath information to share or questions please let us know.